Scientists at the German Aerospace Center (Deutsches Zentrum für Luft- und Raumfahrt; DLR) have developed an entirely new kind of drive concept to extend the range of electrically powered vehicles. The free-piston linear generator (Freikolbenlineargenerator; FKLG) is a combustion engine that generates electricity. This electrical power drives the electric car when its battery is flat. In contrast to conventional range extenders, different fuels can be used in the free-piston linear generator. Researchers at the DLR Institute of Vehicle Concepts in Stuttgart have demonstrated the feasibility of this technology on a test bench specifically developed for this purpose. This makes them the first in the world to succeed in commissioning this kind of energy converter, comprising an internal combustion component, a linear generator and a gas spring. "Innovative solutions like the free-piston linear generator will help to make electrically powered mobility an everyday reality and demonstrate the scientific strengths of Baden-Württemberg as a location," said Rolf Schumacher, the Ministerial Director at the Ministry of Finance and Economics in Baden-Württemberg, at the official inauguration ceremony for this project. Engineers have been aware of the principle of this drive unit for some time. Through the installation of a gas spring, DLR researchers have now succeeded, for the first time, in operating this system in a stable manner. The challenge here was to develop a particularly powerful mechanism with a highly dynamic control unit that regulates the complex interactions between the individual components," said Ulrich Wagner, DLR Director of Energy and Transport, as he described this innovation. The free-piston linear generator works in a similar manner to a conventional combustion engine. But instead of converting the linear movement of the piston into the rotational movement of the crankshaft, it generates electricity directly. A fuel-air mix is ignited in the combustion chamber. This expands and pushes the piston towards the gas springs. These springs decelerate the piston movement and push it back. The linear generator converts the kinetic energy of the piston into electricity and this in turn powers the electric motor. The control system devised by the DLR engineers is able, for example, to control piston movement accurately to within one tenth of a millimetre. At the same time, it recognises fluctuations in the combustion process and compensates for them. In contrast to conventional drive technologies, the free-piston linear generator enables the compression ratio, piston speed and cubic capacity to be adjusted flexibly. For this reason, different fuels can be used – from petrol, diesel and natural gas through to ethanol or hydrogen. By virtue of its versatile properties and depending on vehicle speed and driving characteristics, the settings of the DLR range extender can always be adapted to deliver the optimum operating strategy. "We can therefore set the operating point of the engine when driving to ensure that we can drive as efficiently as possible and in the most environment-friendly manner," summarised the Director of the DLR Institute of Vehicle Concepts, Horst E. Friedrich. At the same time, the free-piston linear generator functions with fewer components. For example, certain crankshaft and camshaft components normally essential in a conventional combustion engine can be dispensed with altogether. Exceptionally efficient range extenders such as the free-piston linear generator are more than just emergency power units. The free-piston linear generator makes it possible to equip electric vehicles with a much smaller battery while still deriving optimum benefit from electrically powered mobility. Short distances of up to 50 kilometres, in town for example, can be covered using only electrical power; for longer distances, the range extender takes over. It provides the accustomed peace of mind and autonomy of a combustion engine. As a bridging technology, it makes electric vehicles an attractive option for the general public. 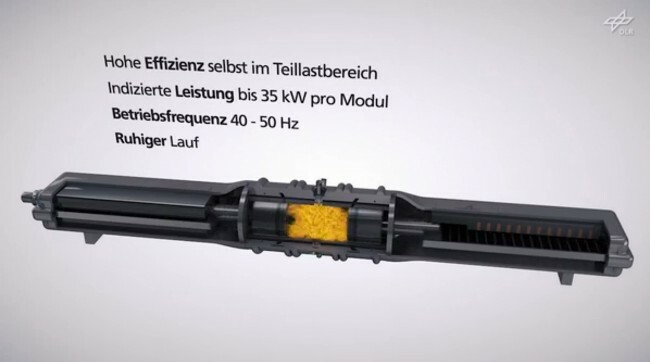 "With our functional demonstrator, we have shown for the first time that our free-piston linear generator principle can be implemented. In the next step, we need to work with industry to develop this technology and build a prototype," explained Friedrich. To accomplish this, DLR has concluded a technology transfer contract with Universal Motor Corporation GmbH and will provide scientific support during further work. One of the tasks ahead is to optimise the weight and size of the free-piston linear generator in such a way that one or more of the assemblies can be located in the underbody area of a vehicle. In this way, initial estimates suggest that an additional range of about 600 kilometres could be achieved without increasing the weight of the car.